Home » Kits » Kits Ahoy! I am in the process of developing some kits that people can buy to “take and make” at their own leisure. First up is the ‘Madbird Tassel Making Beginners Kit’. 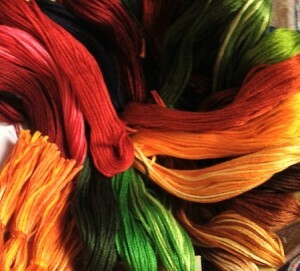 Good news is I got chance to play with lots of yummy, warm and sumptious colours. Always a good thing in my mind during chilly February days. Made me think of fruit salads, rhubarb crumbles and custard, spring greens, pistachios and chestnut mushrooms…. what about you? Once I’d decided which type of kit I would start working on, I had to trial my own. I needed to carefully document each stage as I completed it and then try to capture images to illustrate the important bits! Much head scratching and attempts to write clear instructions ensued, especially as I knew what I was talking about and I have to remember whoever buys such a kit may never have done anything crafty before. Much scribbling, rubbing out and re-jiggling followed. Anyway – these are the tassels I made. What do you think? Would you fancy making some? Having written, edited and illustrated the instructions (so wish my husband (graphic designer whizz) and my son (illustrator extraordinaire) were at home to help), I made up a few kits for the testers. If you have any thoughts too… please do leave a comment or two. It would be nice to hear from you. Happy Tassel-Making my lovely Testers! 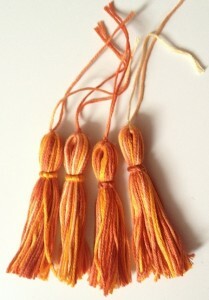 what beautiful tassels, colours remind me of spring waiting to happen. 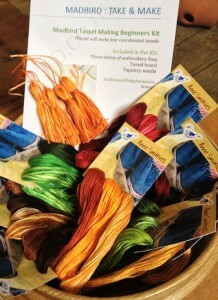 I was one of the lucky women to test a tassel making kit. It went very well indeed. Although not an excellent sewer, I found the instructions easy, well thought out and humorous in all the right places.